"Panch Mahal", the "Five-storey Palace" incorporating architectural aspects of a Buddhist Temple. A perfectly kept, Mughal city. 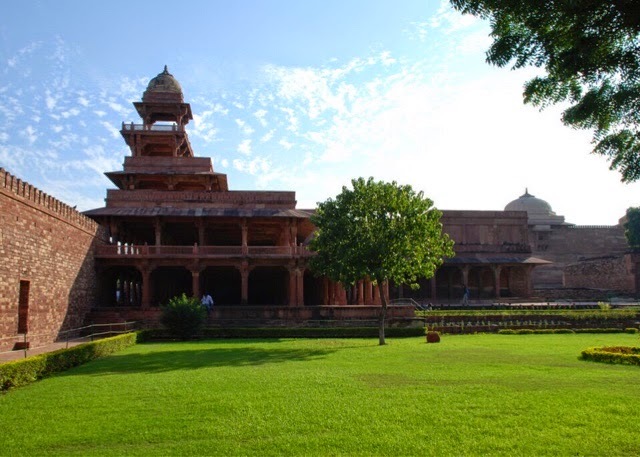 Fatehpur Sikri was the purpose-built, Mughal capital of India, built by Emperor Akbar. Now it’s a red tourist destination, an open air museum, surrounded by green lawns. It was originally deserted after only 10 years of use, due to lack of water. This archaeological site is half-way between Jaipur and Agra and I had never heard of it before our tour to India. But it was worth the stop. Let me tell you about our drive from Jaipur to Fatehpur Sikri first. Headache comes to mind. And admiration. After a wonderful evening under the Jaipuri sky and a slow start to the day around the blooming gardens of Chowki Dhani, driving on an Indian motorway was as contrasting an experience, as everything else in India. It involved relentless beeping when it came to overtaking. This seems to be in use in general, instead of indicating and when the drive is 4 hours long, there comes the headache. Our driver's side mirror was completely broken and the car's acceleration was painfully slow, but that didn't stop him from "racing" down the motorway at a top speed of 60mph! We were all holding our breaths in, when camels were lazily walking against the traffic on the motorway or when we had to overtake a family of five on a motorbike, or when we had to overtake tall stacks of grass topped with a ladder, seemingly floating on the motorway, only to realise that there was a motorbike underneath it all. An eye-opening - often stressful - experience. But we also saw people showering in their front yard, out there in the open, waving and smiling under the morning sun, as we drove by! There is a little uphill walk from the car-park to the gate of the site. Make sure that you agree with the rickshaw driver that they are taking you all the way up to King's Gate, outside Salim Chisti's Tomb. ”England, America? Deutch, Deutch!” He proclaimed! “Ha, England” I replied, that’s "yes", The "E" in England is pronounced as in "pet". I continued in my basic Hindi: "Why are you not at school?" He shrugged his shoulders, "I don’t know". I said to him that I’ll buy him a drink, but I’m not giving him money. "Cola chahiye", he wanted a Coke. So I got him a coke and myself a Lilt and we just sat there looking at people passing by together. No this was no great conversation, but this is the very reason I love learning foreign languages. You get to talk to people that you'd never meet or speak to otherwise. Diwan-i-Khas - The Emperor's audience hall. 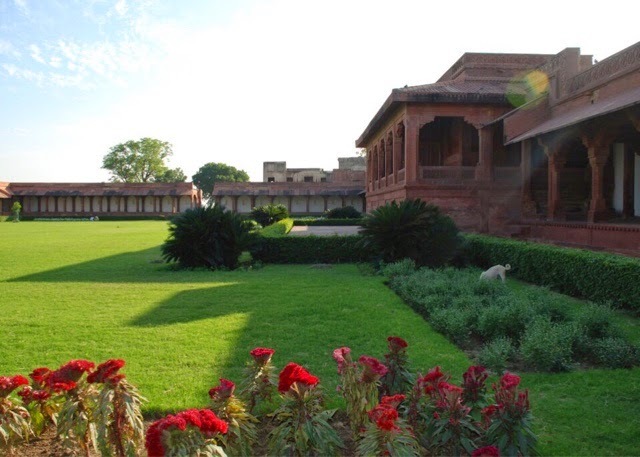 One of the most noteworthy buildings is Diwan-I-Khas, the emperor's audience hall. This type of room - or rather hall - can be found around many palaces in India; the one in the Red Fort in Delhi was spectacularly made out of marble, embroidered with coloured, floral mosaics, to accommodate audiences for Shah Jahan. 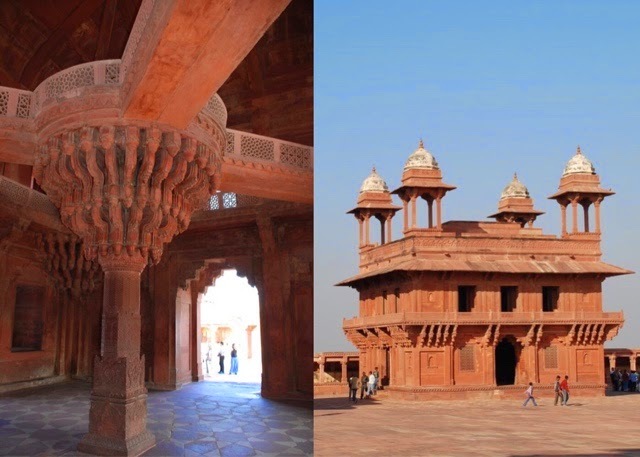 This one in Fatehpur Siri, is made out of red clay and includes a heavily curved central pillar that seems to hold the whole thing up. My favourite was Panch Mahal, a five-storey building, with Buddhist temple architectural aspects that is believed to have had glass panels between the 84 columns holding it up. It must have shimmered and reflected all of these lovely and earthy reds and terracotta colours in the sunshine. It's close to the harem buildings hence it's believed to have been used for entertainment. What I find fascinating about Akbar was that he was an inclusive leader for his time, trying to reconcile religious characteristics of his subjects. He was married to Muslim and Hindu princesses and allowed them the freedom of exploring and practising their religions. And one of the central buildings in Fatehpur Sirkri is Birbal's house. He was Akbar's Prime Minister and a Hindu. His court was dotted with poets and singers of the time from all corners of his empire. A rather progressive thinker. 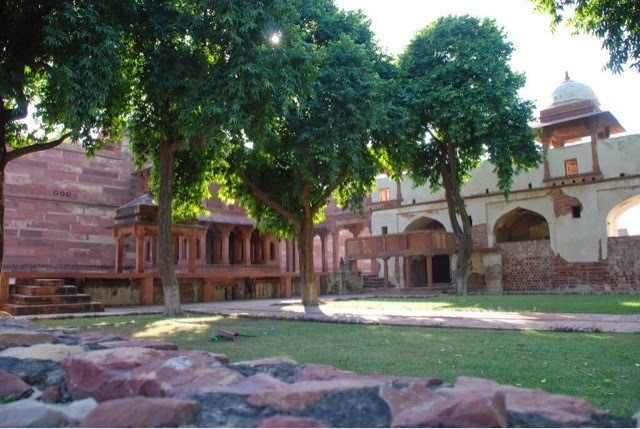 Janta Darbar - The Public courtyard where games and audiences took place.